Riders were asked to choose a colored ribbon representing the person they would like as president, and display it on their mirror. The four choices were red, blue, yellow and green, for Republican, Democratic, Libertarian or Green parties, respectfully. We offered information on the four party platforms also. More on the results later. 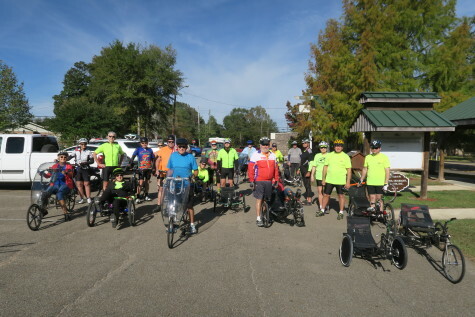 Then, we challenged riders to begin riding toward Hattiesburg, from Sumrall. The general idea for the day was to ride your age, in kilometers, and discuss your voting choices with fellow riders. This seemed to be a good balance of energies. We think most folks met their challenge and some exceeded theirs! The weather was picture-perfect and it was fun to trike the trace with customers and friends. The group I was with decided to go all the way to downtown Hattiesburg to explore the newest extension of the trace. It was fun seeing the tailgaters, and smelling the food cooking for the Southern/Charlotte football game. I think they had fun watching our long line of recumbents as well. We made our way to the train depot and tried to crash a wedding reception, but were directed off the train platform by an armed guard. No worries, as the line of wedding guests seemed to still enjoy our procession as well as we enjoyed theirs. Too bad everyone didn’t make it downtown, as that was one of the many highlights of the day for this rider. But there were many highlights. The bus ride from the RideSouth shop, the excellent food from Chick-fil-A, the sense of community and support from everyone, all together made the event. Riders told me they achieved their personal best ride, and what a great day to do it on! Everything went well except for one flat on Slidell Jim’s recumbent bike/with side car. Friends helped to retrieve him and his dog Charly to the lunch area, where both seemed good natured about it. Another highlight for me was to discover so many supporters for the Green Party. It has been my personal experience that once properly introduced, most folks really like Jill’s policies and platform. Too bad the corporate media has worked very hard to avoid that proper introduction! Even so, there were about as many green ribbons given out at the start as red ribbons. There were a few yellow ribbons and one blue ribbon asked for. Some folks showed up after the start and did not get a ribbon. Some did not want to indicate their choice for president. In summary, the America’s Choice Ride was the most meaningful event we have ever organized . . . my personal best. The personal achievements, the local sense of community witnessed throughout the day, and the far-reaching and all-important consequence of our actions for our country, and our planet, coupled with some great fellowship, made the day awesome! Thank you to all that participated! To heal America and achieve Democracy will require that we all find our personal best. I want my grandchildren to have the opportunity to have grandchildren of their own. War, hate, or ignoring the two, will not get it done. Next post: Bicycle and Kayak Sale!